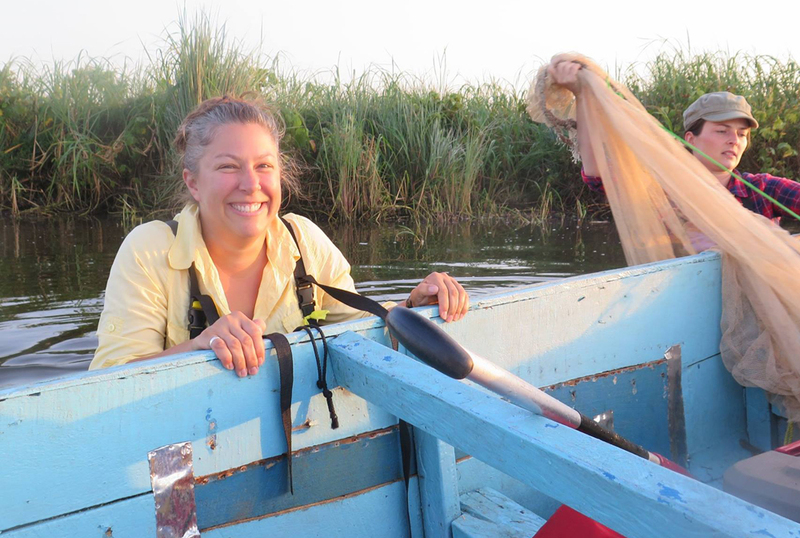 The assistant professor in CFAES’s School of Environment and Natural Resources talks about water, fish and her recent big honor for teaching. 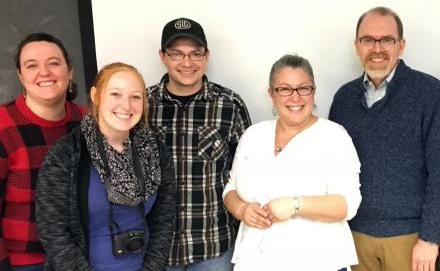 Late last winter, Suzanne Gray, an assistant professor in the College of Food, Agricultural, and Environmental Sciences (CFAES), got a surprise visit in her classroom. A happy entourage including CFAES Dean Cathann A. Kress and Jeff Sharp, director of the School of Environment and Natural Resources (SENR), Gray’s home department, dropped in while she was teaching. The purpose? To tell her she’d won a 2018 Alumni Award for Distinguished Teaching from The Ohio State University, one of only 10 given university-wide. The award honors faculty for superior teaching. Ohio State has more than 2,800 regular tenure-track faculty. Gray specializes in fish, especially freshwater fish, and how changes to the water they live in — turbidity and harmful algal blooms, for example — affect them. 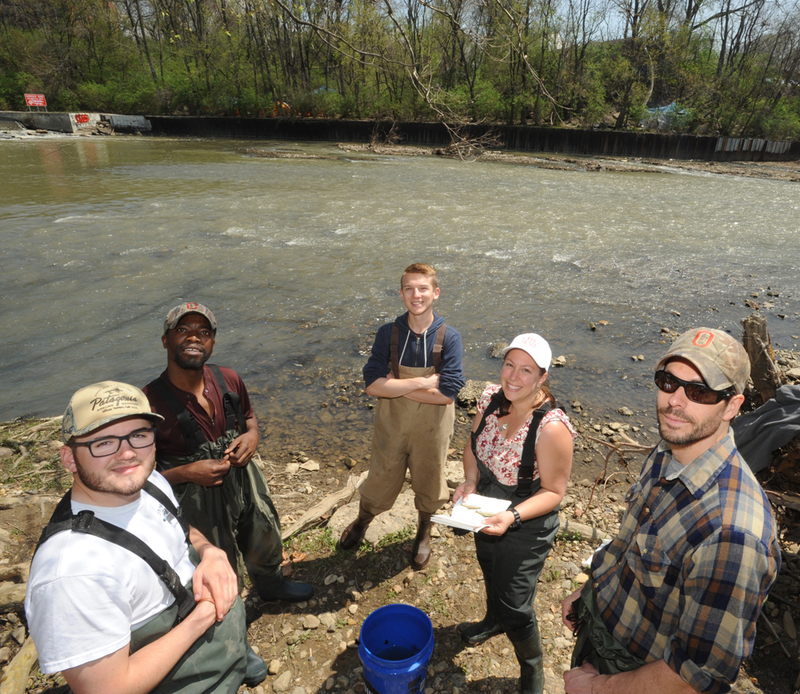 Her aquatic ecology and management courses, which include Taxonomy and Behavior of Fishes (ENR 5350.02), are a “draw for students who appreciate the opportunity to solve problems,” according to Ohio State’s website about the honorees. Stone Laboratory, part of CFAES, is located at Put-in-Bay on Lake Erie. 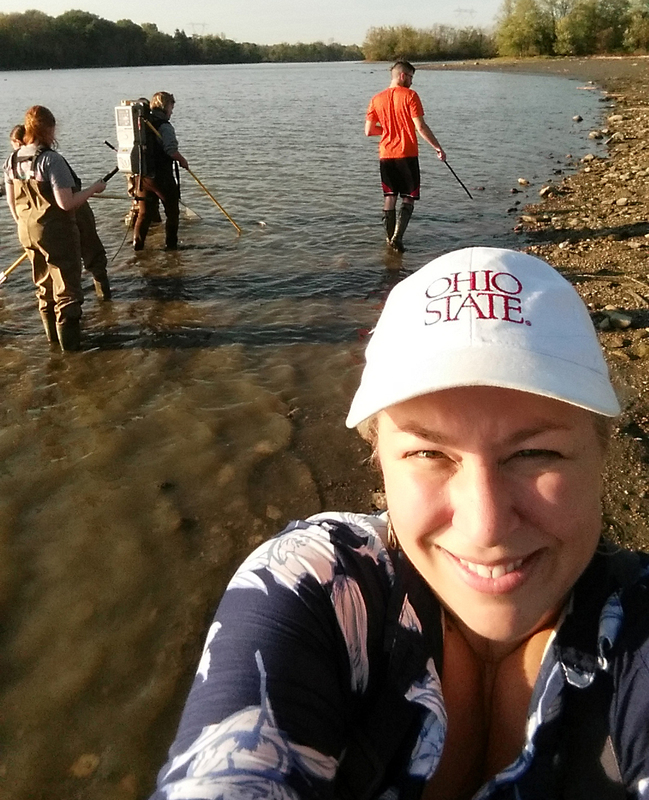 Gray, a native of Canada who joined CFAES in 2013, spoke in mid-June from the lab, where she was co-teaching Ichthyology (EEOB 5930), an upper-level course offered through Ohio State’s College of Arts and Sciences, specifically its Department of Evolution, Ecology and Organismal Biology. Q: What was your reaction when they told you about the award? A: I was definitely shocked when they surprised me in my classroom, and to be honest I assumed that something was wrong at first to have all these people streaming into the room! Once I realized what was happening, I had to just hold back the tears, because it was a bit overwhelming. I felt really honored, especially since it was my students who initiated the nomination. That means so much to me. Q: What got you interested in fish? A: I grew up in Nova Scotia, feet from the Atlantic Ocean. My family jokes that I could swim before I knew how to walk. I spent my summers playing in tide pools, catching anything that moved, and fishing. I was always just fascinated in how the fish moved, where they lived, what they liked to eat. An undergraduate tropical field ecology course [at the University of Guelph, Ontario] exposed me to the Great Barrier Reef in Australia and the incredible diversity of fishes. I also just always loved being in and around water, so when it came time to choose a graduate project, I wanted to study fish, preferably in their natural habitat. Q: What do you like — love — about studying fish, and about teaching about fish? A: I think my love of water really inspired my love of fish. When I learned that I could actually study them for a career, I was so excited. 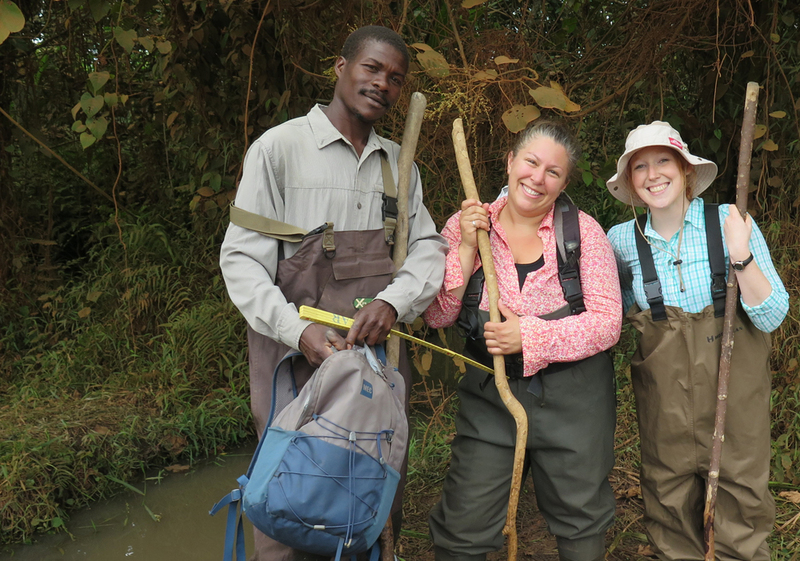 I think what drove my passion for studying fish, though, came when I started to see how we, as humans, are altering fish habitat, destroying water quality, and it made me both angry and inspired to do what I can to help conserve fish populations around the world. I soon realized that the more people I could share my passion about fish and water quality with, the more stewards of our aquatic habitats would be out there, making decisions, questioning decisions about how we alter the environment. Q: How about teaching — what is it that you like about it? A: I wasn’t initially sure how much I liked teaching. I think it’s something I grew into as I saw how I could help provide students with experiences they might never have had. 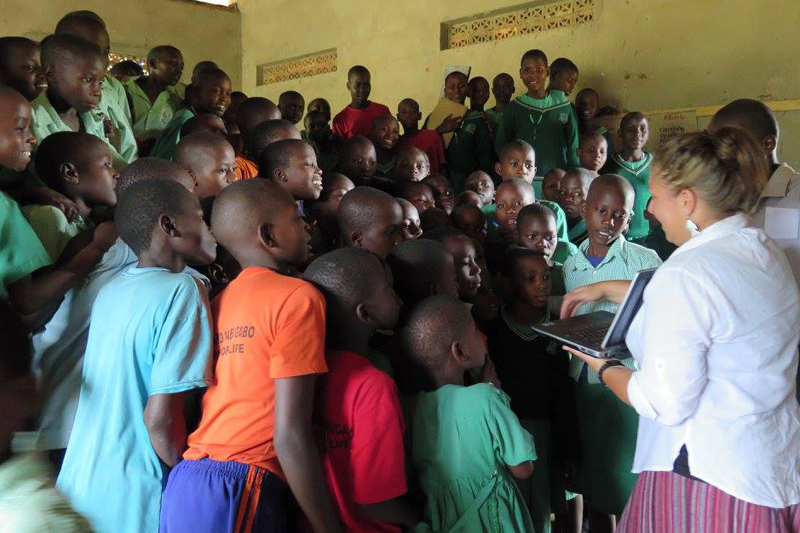 For example, one of my students had never traveled outside the United States, but through my research and teaching I was able to give him an opportunity to travel with me to Uganda. Another student had never held a live fish before she took my class, but seeing her eyes light up when she did, and hearing her tell her friends what she had done was again inspiring. I find those one-on-one experiences with students to be really rewarding. Q: Have you had any epiphany moments, times when you thought, “Wow, I really like teaching!”? A: Hmm, I seem to have answered that above. But I would say it’s when I get a small thank you email or card, a note saying that by taking my course or working with me in the lab a student found their path — whether it’s with fish or not. Or when one student ran into my office at the end of the semester to tell me they had brought their GPA up enough to get into grad school because of some advice I had given them, or a high five in the hall from a student who got the job he wanted in Alaska. These small moments really make it all worth it. Q: You said you got angry and also inspired when you first started seeing the impacts of people on fish and water. Today, at this point in your career, what gets you angry? A: Mostly the apathy toward healing our environment that many people have, or the blatant disregard for the environment that some politicians and industry leaders have. A: The scientists and public who are working so hard to move the science into the public domain, to provide educational tools, and to offer management solutions for cleaning up waterways. I have hope that there’s a growing awareness about how humans impact water quality and fish diversity. There are some really inspiring researchers who are pushing the boundaries of scientific communication. In some cases, the work of government scientists has led to the recovery and delisting of endangered species. A: I always find this question difficult. My parents taught me to pursue in life what makes me happy, and they’ve been my rocks throughout my career. With respect to mentorship, my postdoctoral advisor, Dr. Lauren Chapman [professor and Canada Research Chair in Respiratory Ecology and Aquatic Conservation at McGill University, Montreal, Quebec] is someone I always look up to — for her knowledge of fish and aquatic systems, for the way that she interacts with colleagues, and for the way she so patiently works with students from all over the world. I seem to have more antiheroes — like the high school guidance counselor who told me I’d never make it in science, the professor who said I was a lackluster student — these folks inspired me to prove them wrong and to become a teacher who encourages students to pursue their interests and provides them with the tools and support to meet their goals. Q: What are your top five favorite fish species? A: The lowly threespine stickleback is the first fish that I researched and got me excited about freshwater fish biodiversity. The sarcastic fringehead is a ridiculous marine fish whose behavior I’m fond of. You just have to search for it on YouTube to get the full effect! Frogfish is another favorite when diving on coral reefs because it’s just such a cool example of adaptation and diversification. I also have a soft spot for the African cichlid I work on now — Pseudocrenilabrus multicolor, which we call “Bluelips” — because of its ability to cope with extreme environmental conditions. The dwarf pufferfish is just really cute. Q: What are your top five favorite “fish places” — locations or habitats for seeing, studying or just being around fish? A: Well, I’m partial to any water body! But, the little beach where I grew up in St. Margaret’s Bay, Nova Scotia, is where I discovered fish and my love for water. Lake Matano, Sulawesi, Indonesia, is an incredible lake with fish and other biota unique to only that lake — they’re not found anywhere else in the world. Lwamunda Swamp near Lake Nabugabo in Uganda is one of my favorite places in the world and also has some pretty unique fishes — African lungfish, weakly electric fish called mormyrids and Bluelips. There’s a river in northern Ontario called the Kabinakagami River [300 miles north of Sault Ste. Marie, Michigan] that’s largely unpopulated and where you can catch a walleye almost immediately upon casting. Lake Erie is also really growing on me! The photo at the top of the page was taken in the Olentangy River by Ken Chamberlain, CFAES (2014).